East Side Printing Co needed a chalk installation in their newly renovated shop. This rotating 4″x 9″ partition wall would include a hand-lettered collage of their services on the back while informing walk in customers where to pick up their freshly printed materials on the front. This project took a total of 39 hours to complete and it was all recorded and condensed into a 3 min timelapse so you can watch my process from start to finish. While creating this project, I live streamed my design and digitalization process on Twitch Creative. This was such a huge project with over 30 words to draw from scratch so it was nice that my following could keep me company. During the first week of production, I put together various type samples in a Pinterest Mood Board for Randy to create a solid art direction for the project. 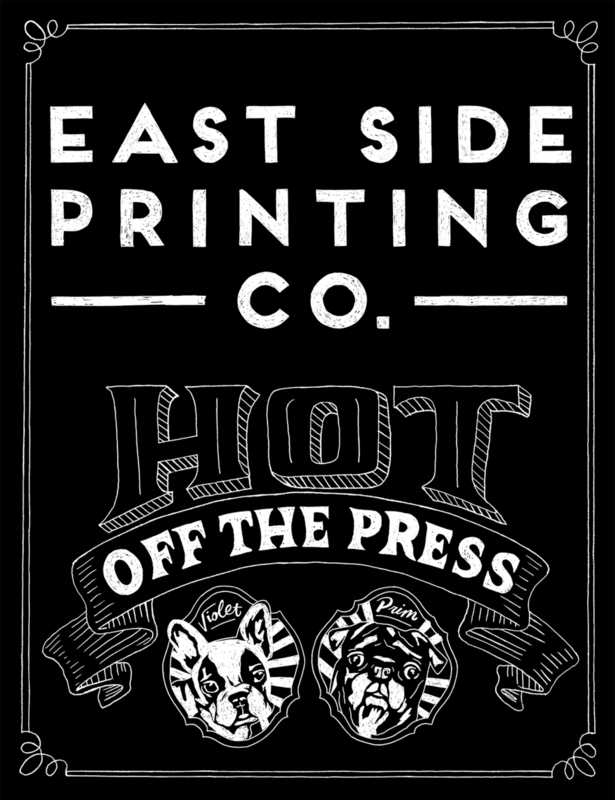 On the front side of the mural, we would include the logo, the phrase “Hot off the Press” to show where clients could pick up their prints along with some illustrations of the Randy’s dogs that hang out at the shop most days. To finish off this side I would add a simple frame surrounding the artwork similar to the Hot Cocoa sample to give it that last finishing touch. Then on the back is where we could really get creative with a new version of their logo where “East Side” would be in bold script and “Printing Co” would be in a more chunky type style. For the type, we decided on an old school victorian style that would have a bold industrial feel that wouldn’t come off too feminine. Then for the dog illustrations, I would include their names and in case their faces in a mirror-like frame in order to make sure both dogs were easily seen on a black background. 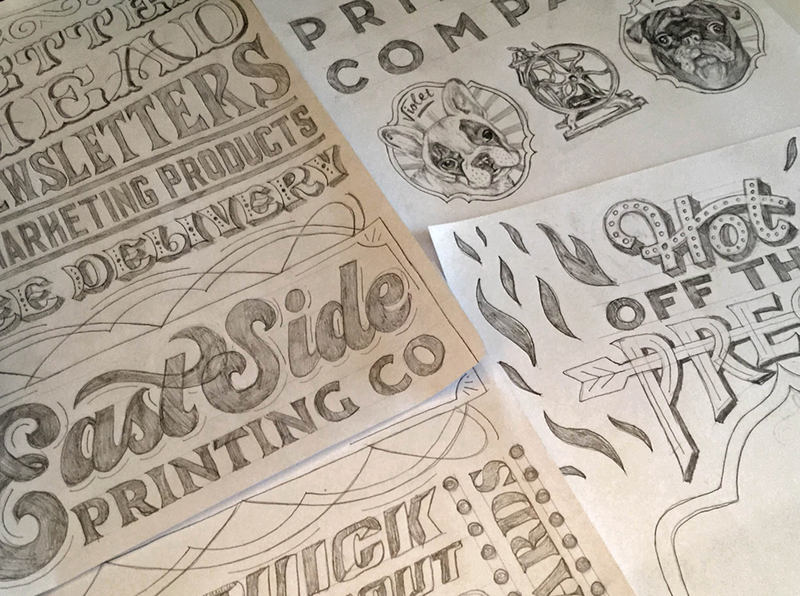 Once I had an art direction in mind I was able to hit the ground running with some sketches. I had pooled together some great font pairings in our Mood Board so it was fairly easy to piece this project together. When drawing this piece I needed to make my lettering as big as possible so I used two 8.5 x 11 sheets of paper to create each side. This way I could get more detail into each design while making it easy to scan for digitalization. I started with the back first since it would take the most planning on figuring out how to layout the 20 services and new logo. I boxed out my layout in order to decide on how the words would fit neatly inside the space while also remaining legible. It was important for this side to fill up the space while having an even margin around the artwork. The back only had some minor adjustments to a few select services during production where certain styles were simplified to increase readability in order to have a stronger more masculine feel. Then for the front, we only had the top half to play with since a shelf would sit directly in front of the wall that would hold new prints ready for pickup. The front side ended up having the most revisions when it came to which logo would work best in the space along with the style of “Hot Off The Press”. The original “Hot Off The Press” ended up being too playful and got edited into a design that was a bit more simple and better matched the type styles on the back. Randy and his team created a custom rotating panel that had a beautiful wood frame with chalkboard paint on both sides for me to work on. I started the installation by using my Artograph projector in order to trace the lettering on both sides using a thin chalk pencil. It took about 3 days total of working about 3 to 4 hours at a time to get this piece fully chalked in. With simple Crayola white chalk, I filled in my lettering and used wet paper towels and q-tips to clean up any mistakes or smudges. Then after the artwork was complete I sprayed a few layers of workable fixative to help keep the final artwork in place. In addition to creating a chalk mural, Randy also wanted me to digitalize the final artwork with a chalk-like effect in order to use for promotional materials. So I took my original pencil drawing and inverted the colors in Photoshop and began to clean up my artwork with my Wacom tablet so it would match the same aesthetic of the chalkboard. Since we ended up using a different version of the logo on the front I had to redraw that asset along with the dog illustrations to make sure that the dogs were more vibrant on a dark background.